Continuing with Summer Color Schemes “Sea & Sky”, yellow combines beautifully with so many blues. Blue or yellow is an enduring color scheme and can be found in tiles, dinner ware, bowls, vases, fabrics, decorative plates and jewelry in countries all around the Mediterranean, and from there across the Atlantic in Central and South America. 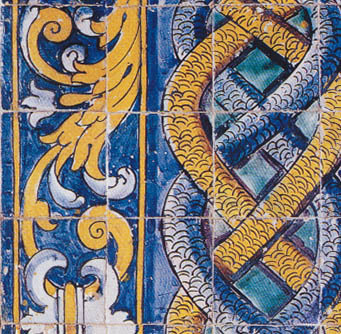 In Portugal, entire buildings are covered with blue and yellow tiles, inside and outside. This entry was posted in Blue & Yellow colors for summer stitching, cross-point Color Schemes, Summer and tagged blue & yellow pillows, color schemes for stitching, cross-point, cross-point color schemes, Sieglinde Anderson Designs. Bookmark the permalink.